That’s the way most urban fantasy heroes are. They take on a conflict out of a sense of duty or responsibility. When I’d run, they stay and face the foe. They have the strength or knowledge or skills to, hopefully, survive and defeat the bad guys. Most of the protagonists take on a challenge to protect other people. They aren’t looking for power, but it’s often a by-product of the struggles they undergo. Defeating villains makes a hero dig deep and changes him. A long, long time ago, I attended a mystery conference where Mary Higgins Clark was the keynote speaker. She explained the elements needed to write a woman in jeopardy story. It’s been too long ago to remember subtle points, but the main ingredients were: a good woman is living an ordinary life; a bad guy is bent on a journey of destruction; the two collide; the woman has to struggle to survive; and she’s forever changed by coming into contact with evil. Even though she didn’t choose her journey, she chose to do everything in her power to survive it. Stakes have to be high, and body count isn’t enough. The reader has to care about the victims, or a body sprinkled here, and another one there, just feels like a plot ploy. I’ve read books and watched movies where every time the pace slows a bit, I know another person’s going to bite the dust. Sometimes, it works–if I learn something from the death or there’s a ticking clock or the victim was sympathetic. Sometimes, it doesn’t–when I feel like the writer didn’t know what else to do so killed someone. The deaths have to provide some kind of emotional impact. Not all heroes face fierce enemies. When I wrote the short, romance novellas for The Emerald Hills collection, the heroes’ goals often involved chasing dreams. The hero in the romance I wrote for my agent was chasing a dream, too. I can relate to that. But achieving a story’s goal can never be an easy undertaking. Things go wrong. Nothing’s as simple as it could be. The goal has to be earned. The stakes have to be high, or the book’s tension is low. In Demon Heart, a demon escapes one of Gazaar’s pits when he’s off-duty. Babet hopes the demon stays far, far away from River City, but Prosper and his fellow detective, Hatchet, hope it comes to them. As Prosper says, “Who else can deal with him like we can?” Babet is every bit as much of a hero as Prosper. She’s just a reluctant one, and when the demon comes, she doesn’t back down from the fight. May your heroes have plenty of conflicts and survive them all. (I like happy endings). And happy writing! ‹ PreviousWriting: How bad can bad boys be? I love creating an air of expectancy, then have it all turn on its head – leaving the reader gasping in shock or surprise. I went to your blog and watched Hamish dive into the molasses, then roll in the coconut. I can see that you would like shock and suprise:) Great fun! Never been into the bad boy type, but like it when he’s not too goody-goody. Mostly liked the quirky, edgy types. And great newsletter!!! Thanks! The newsletter still isn’t coming so easily for me. Thought I’d sent it on Jan. 1st & didn’t realize I hadn’t for almost 2 weeks. I’d missed a step. But I’m learning…slowly. Sorry to take so long and leaving a comment! I read your post earlier this week and then Life just got too crazy. I love your post because you could take the time and go into such depth about an element in writing. I always learn something from you Judith. This post didn’t disappoint! Thanks, but your writing’s pretty darned good, as is. Wish so- all works in progress! How could I say it any better? 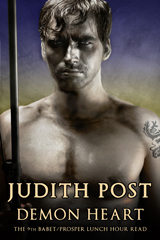 Judith is a great writer! Thanks for the reblog. It’s always fun for me to WRITE heroes and heroines, because I’m the kind of person who’d rather hibernate or work behind the scenes:) Living vicariously through them is enough for me. Isnt that why we write? Arent most writers hermits?! And a great cover designer—whew we! !